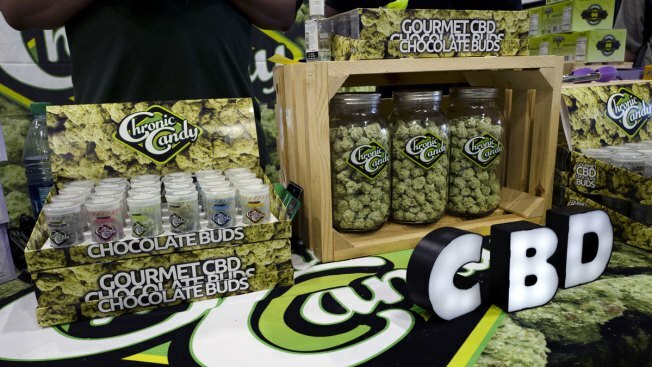 In this Friday, Aug. 31, 2108, file photo, CBD buds of chocolate by Chronic Candy are displayed at the Big Industry Show at the Los Angeles Convention Center. The Food and Drug Administration is looking for "pathways" to legalize the sale of CBD oil and other cannabis-based compounds in food and beverages in a move that could remove one of the last remaining legal hurdles for companies hoping to sell such products across state lines. FDA Commissioner Scott Gottlieb outlined steps the agency is considering in regulating cannabis products after President Donald Trump signed the farm bill into law on Thursday. The legislation — an $867 billion, five-year spending bill that funds agricultural, nutrition and other federal programs — also loosened some federal restrictions on cannabis. It legalized hemp by removing it from the Controlled Substances Act while preserving the FDA's authority to regulate the products. "I think it's really a game-changer," said Joshua Horn, a cannabis industry lawyer and partner at Fox Rothschild. "The significance is now you have some aspect of the cannabis world legalized on a federal basis." Cannabis infusion has scientific complexities, says Tilray CEO from CNBC. "Canopy Growth will participate in the American market now that there is a clear federally-permissible path to the market," he said. Banks, which have been steering clear of handling hemp or cannabis-related business, also may be more apt to broker deals or process other transactions that they have previously avoided because the products weren't legal under federal laws, Fox Rothschild's Horn said. The FDA currently prohibits companies from adding CBD and THC to food, drinks and supplements and from making any therapeutic claims about their products. It also prohibits the sale of food, supplements and other products containing CBD across state lines. "We recognize the potential opportunities that cannabis or cannabis-derived compounds could offer and acknowledge the significant interest in these possibilities," Gottlieb said in a statement. "We're committed to pursuing an efficient regulatory framework for allowing product developers that meet the requirements under our authorities to lawfully market these types of products." Until the FDA adopts new rules, it will continue to enforce current restrictions around cannabis products. But in signaling it's willing to relax its stance, the FDA could spur even more interest in cannabis-derived products. Industry analysts have already expected a major boom in CBD — short for cannabidiol — oils, drinks and more. Consumers are increasingly interested in CBD, a non-psychoactive compound found in cannabis plants thought to help with a range of conditions, such as anxiety, sleep disorders and inflammation. Some companies are technically skirting federal law, already infusing coffee, cocktails, lotions and even pet treats with CBD. The FDA is "aware of the growing public interest in cannabis and cannabis-derived products," Gottlieb said. The FDA plans to hold a public meeting soon seeking input on how to legalize the marketing for cannabis-derived compounds and make sure the laws are more predictable and efficient. "While products containing cannabis and cannabis-derived compounds remain subject to the FDA's authorities and requirements, there are pathways available for those who seek to lawfully introduce these products into interstate commerce," Gottlieb said. "The FDA will continue to take steps to make the pathways for the lawful marketing of these products more efficient." In the meantime, the FDA will continue to go after companies that make egregious unproven claims. It has already issued warning letters to companies selling CBD products, including those that claim to fight cancer. Regardless of federal laws, companies have already started rolling out CBD products. The farm bill will likely accelerate this trend. So the FDA can either create ways to exercise some authority over the products or leave them largely unchecked. The FDA's recent approval of Epidiolex — a cannabis-derived CBD drug — shows that the regulatory body may be open to a gradual, controlled introduction of other products going forward, Horn said.